Another pic of me (hey, they only show up when I go to women’s blogging conferences, so let me bask in my vanity for a moment). 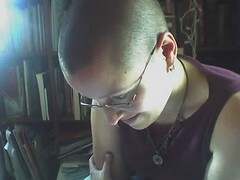 This one was taken from Badgerbag‘s camera phone while I intently studied that weird article written about me in the San Francisco Chronicle.The WoolfCamp Afterglow was amazing. But since I’m running out the door to a Dresden Doll’s concert (an event I was invited to about 20 minutes ago), please allow me to direct you to the Woolfcamp Blog for more details.Cheers to community, women, technology, writing, and all the awesome people I met this weekend!